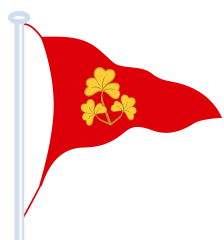 1.1 The Organising Authority is Lough Derg Yacht Club in consultation with the participating fleets. 1.2 The regatta will be governed by the “rules” as defined in the Racing Rules of Sailing (RRS), the prescriptions of the Irish Sailing Association as applicable, the current Class Rules, this Notice of Race, the Sailing Instructions and any amendments thereto. 1.3 WHISTLE SYSTEM -To encourage boats to take penalties afloat, official observers may blow a whistle when they see what they believe to be a breach of a rule. 2.1 Each boat is required to display the sail number described on their Entry Form. 3.1 The regatta is open to boats of the Squib and Flying Fifteen classes. 3.2 Boats shall comply with their class rules in respect of class membership. 3.3 Sails shall display the full sail number in accordance with the Class Rules and RRS. 3.4 Overseas entries are welcome in all classes. Entry Fee includes participation, craning (where necessary), parking/mooring and honorary membership of LDYC for the duration of the event. The race committee may, at its sole discretion, run one extra race per day. the venue and will be posted on the event pagehttps://loughdergyachtclub.wildapricot.org/event-2750152. 7.1 Boat & Car Parking arrangements will be posted on the club notice-board. 7.2 The race office is located in the Club House on the ground floor. 8.1 The regatta racing will be held on courses as described in the Sailing Instructions. 8.2 The race area will be on Lough Derg and include Dromineer Bay to Williamstown in the West and to the South of Illaunmore in the North. 9.1 A total of 6 races are scheduled for the Squib and Flying Fifteen Classes. 2 races are required to be completed to constitute a series. 9.2 When fewer than 5 races have been completed a boat’s series score will be the total of her race scores. 9.3 When 5 or more races have been completed, a boat’s series score will be the total of her race scores excluding her worst score. Keepsake prizes will be awarded to each class. The number of prizes will be determined by the number of entries and at the discretion of the Organising Authority. Perpetual Class prizes may also be awarded. (g) Neither this Notice of Race nor the Sailing Instructions nor any action by Lough Derg Yacht Club, the Organising Committee or Race Committee in any way limits the responsibility of the Owner(s) or the Person In Charge. Each participating boat shall be insured with valid third-party liability insurance with a minimum cover of €3,000,000 per event or the equivalent. All owners/competitors who sign the Entry Form, in so doing, make a declaration that they hold such cover. By entering the regatta competitors accept that they may be photographed and/or videotaped participating in the racing and/or using the regatta facilities and they consent to the taking of such images and to the use, reuse, publication and republication of such images in any media, in conjunction with the competitors name or not, without compensation and without the competitors approval of such images or any use thereof. Claire Toohey, LDYC Manager at officeldyc@gmail.com or 067 24455.